Doowopper quintet from Plainfield, New Jersey, not to be confused with Parliament-Funkadelic. The group - started in a traditional barbershop - is named after a cigarette brand. 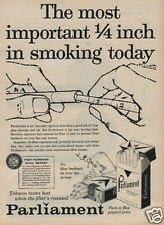 The smoke that was sold under the name Parliament was equipped with a particular, recessed filter, referred to somewhat throbbingly by the manufacturer as the most important 1/4 inch in smoking today.